Representatives for news organizations said at a meeting with Attorney General Eric Holder on Tuesday that the language introduces ambiguities in the rules that zealous prosecutors might try to exploit. The Justice Department said in a statement that the news groups made compelling points that it will consider. The meeting centered on new Justice Department guidelines for obtaining records from news media organizations in leak investigations. Holder did not explicitly agree to rewrite the new rules, but another meeting on the subject was tentatively scheduled for later this summer, said Karen Kaiser, general counsel for The Associated Press, who attended the meeting at the Justice Department’s headquarters. The new guidelines, revealed in February, were designed to give news organizations an opportunity to challenge any subpoenas or search warrants in federal court. They stipulate that news organizations are to be informed of an impending document demand unless the attorney general determines that the notice would threaten the integrity of an investigation, “risk grave harm” to national security or present a risk of death or serious bodily injury. And they say the Justice Department may apply for a search warrant to obtain a journalist’s materials only when that person is a focus of a criminal probe for conduct outside the scope of ordinary newsgathering. But in Tuesday’s meeting, lawyers for media organizations complained that restricting the new protections to cover “ordinary newsgathering” was needlessly unclear. 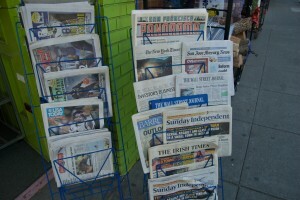 A lawyer for the Newspaper Association of America who attended the meeting, Kurt Wimmer, said the Justice Department, in using the “ordinary newsgathering” language, seemed to be trying to distinguish between a journalist obtaining documents from a source versus hacking into a computer to receive the same material. The guidelines followed disclosures that the Justice Department had secretly subpoenaed telephone records for reporters and editors for The Associated Press, and also had secretly used a search warrant to obtain some emails of a Fox News journalist as part of a separate investigation. Holder declined to discuss the case of New York Times reporter James Risen, who is battling government efforts to force him to testify at the trial of a former CIA officer who is accused of leaking classified information. But the Justice Department said he reiterated his position that no journalist would be prosecuted for “performing ordinary newsgathering activities” as long as Holder is attorney general. Holder also agreed to release a memorandum that was previously distributed to federal prosecutors and that the Justice Department said outlines safeguards intended to protect journalists’ newsgathering records. Under rules established by the government, the meeting was considered to take place “on background,” meaning participants were asked not to record it or afterward attribute specific statements to anyone who attended. But participants were allowed to answer questions about the meeting and describe issues that were discussed. The AP case involves a criminal investigation into the AP’s sources of information about a foiled al-Qaida bomb plot in Yemen. The AP’s story in May 2012 attributed details of the operation to unnamed government officials. In the leaks case after the story, a former FBI explosives expert later pleaded guilty to possessing and disclosing classified information. The Fox News story concerned a report involving classified information about North Korea. The investigation of that story resulted in a State Department expert on North Korea pleading guilty to passing classified information to a journalist.